We take our trailers very seriously. 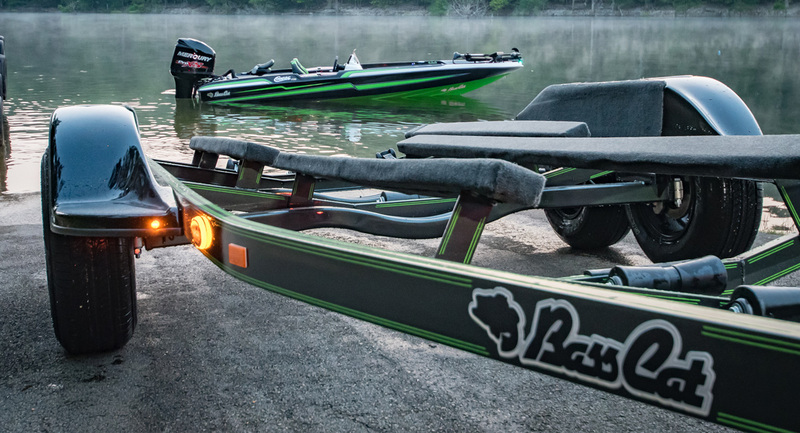 Unlike many manufacturers, we build Bass Cat trailers in-house, one at a time. Custom fit to the specific hull design of each model boat. Every cross member and support is jigged, fitted, and welded using U.S. Steel to exact tolerances. There is zero adjustment on a Bass Cat Trailer. Axles are jigged and welded in a pattern weld to assure minimal tire wear from caster to camber. Our Torqueflex torsion axles provide a true “Soft Ride Suspension”. Each trailer is painted and carpeted to perfectly coordinate with the boat. All trailers receive a PPG urethane clear coat. This provides a heavy rubberized, protective clear coating which helps repel harmful impacts from rocks and other road debris. At Bass Cat, your safety and the investment you have made in your boat are not taken for granted. We demand the highest quality materials and hand craftsmanship for safety and security on the road...It’s a Bass Cat tradition.